Seeing a silverback or female with a playful infant in the wild will undoubtedly change your whole outlook on wildlife conservation. 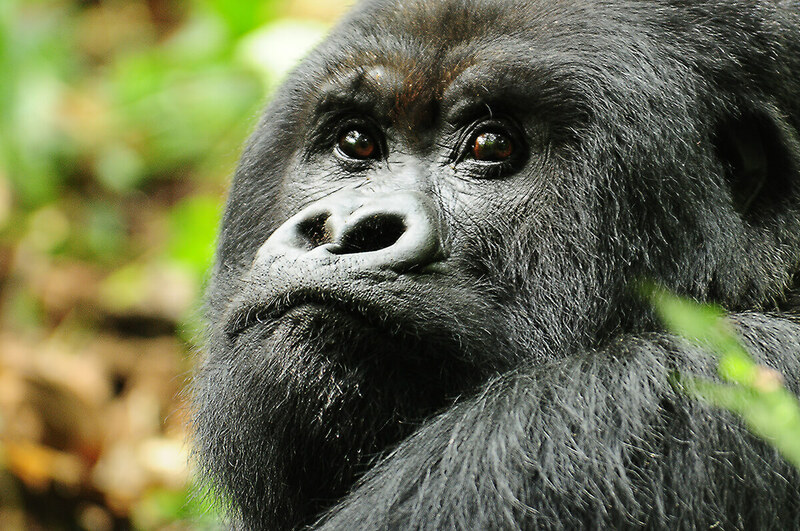 While the mountain gorilla is one of the most beloved animals, it is also one of the most endangered. But there is cause for some celebration – according to WWF, who released the results of a new census early this year, Central Africa’s mountain gorilla population has now risen to above 1,000. This is a 25 per cent increase since 2010. In 1985, I convinced General Museveni (the then future president of Uganda) to set aside the Bwindi Impenetrable Forest as a national park, on the condition that I build a luxury camp and bring in clients, so I’m very proud to have played a part in helping to protect these magnificent creatures. In 1999, I needed a new frontier to conquer. I had suffered a near-fatal polo accident in 1996 and was asking myself “what would it take for me to be on top of the world again?” Then I realised, I could go to the top of the world. With fast research I learned there was an expedition to the North Pole in July 1999 – the last cruise of the century. I predicted that the 12-day journey to the Arctic would be one of the most lunatic endeavours I’ve set out on – and I was right. A journey to the Arctic Ocean would give any man new energy. It may be freezing but it’s a thoroughly fascinating place. In the Arctic there are so many shades of blue. From aquamarine to sapphire, it’s rich and dazzling in a way you will have never seen before. It’s also a place where all the implications of climate change resound with the greatest force, and you’ll return home with renewed commitment to reducing your own contribution to the problem. Kilimanjaro has two main peaks – Kibo and Mawenzi which are connected by a saddle. Kibo is the taller of the two at 19,341 feet and Mawenzi is shorter, at 16,896 feet. The saddle is about 16,000 feet up. Altogether Africa’s most iconic mountain covers 995 square miles. The name ‘Kilimanjaro’ means ‘impossible for the traveller’. It comes from a saying of the Chaga people, who traditionally live on the southern and eastern slopes of Mount Kilimanjaro and Meru, suggesting that Kili is so great that men should be warned against even trying to climb it. At 17, in 1959, I climbed it from the Kenyan side. To train, I rose at 5am for a five-mile run and spent every day for weeks building my stamina and strength, because once you’re on Kili, there’s no easy way off. When most people tell you they’ve climbed Kilimanjaro, they’re usually referring to Gilman’s point but the very top – the peak of Mount Kibo – is Kaiser Wilhelm Spitze (now known as Uhuru Peak). The view from there is all sky and open space – it’s overwhelming in its simplicity. A&K has a summit success rate of 97 per cent, higher than most as we give clients more days to acclimatise to the altitude (and appreciate the journey!). I’ve never forgotten the experience of my first Kili climb. Life is undoubtedly messy. Getting up-close to the ‘circle of life’ is both humbling and thrilling. By nature, the only thing that’s predictable about a game drive is that it will be unforgettable. One day on safari is the great adventure that will change the rest of an individual’s life. The Great Migration is one of nature’s greatest spectacles. Every year more than a 1.5 million wildebeest, 200,000 Burchell’s zebra and a smattering of trailing Thomson’s gazelle make a 1,900km odyssey between Tanzania’s Serengeti and the Masai Mara in Kenya. Instinct and the smell of rain spurs the herds forward with two things in mind: food and water. They are following the rains in search of fresh grass. Along the way, many migrating animals fall prey to waiting predators including lion, leopard, cheetah, crocodile and hyena. Visit Tanzania between January and early March to see thousands of wildebeest being born each day, then from June through September, vast herds are on the move through Kenya. I’ve always been fixated on Egypt. Its history is epic – at sunrise, the pyramids appear blood red and your first sight of the Sphinx will haunt you like an apparition. Approach these ancient wonders on camelback and you’ll feel like you’re starring in a film. It’s a moment you’ll never forget. I understand some travellers’ hesitation to visit Egypt, however the ancient country is awash with optimism right now, and it’s an ideal time to go. There are new hotels to entice, new tombs are being discovered regularly and the world’s largest archaeological museum, the Grand Egyptian Museum (GEM) will – partially – open in early 2019.